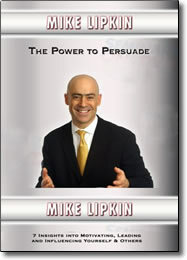 Power to Persuade DVD by Mike Lipkin – Free Video Clip – Discount! This dynamic program covers the The Seven Insights that will inspire you to take charge of your most important aspirations. You’ll also learn how to win people over by helping them win as well. The new reality is that everyone is a leader. Everyone has been charged with the responsibility of adding value, building the franchise or finding a better way. Top professionals understand that the power to lead comes from The Power To Persuade. Mike combines Environics’ Social Values Research with his personal expertise and experience to provide you with the confidence and insights to get excited about change while helping everyone around you do the same. Mike Lipkin is an Internationally known speaker. He is President of Environics/Lipkin, one of Canada’s largest and most sophisticated research houses, specializing in Motivation and Persuasion. As a Toronto-based speaker, author and persuasion coach, Mike has worked in twenty-two countries with over a million people. His impressive list of clients includes top companies like Deloitte, IBM, Pfizer, & Starwood Hotels. In addition, he has authored numerous best selling books including: Keeper of The Flame, Luck Favors The Brave , & On Fire, The Art of Personal Consistency. As a true economic nomad, Mike was born in the UK, raised in South Africa and immigrated to Toronto in 1987.